Jesus frustrates the Jews’ desire for plain speaking, and instead starts to speak about sheep and spirituality. Why does location matter here? Why does Jesus not answer directly? How do you think the Jews feel about Jesus’ answer? How do sheep feel about being sheep? How do you feel about the unity of the Father and Jesus (included or excluded)? Is it more important to know who Jesus is, or to hear his voice? What ethical obligations come with the gift of eternal life? What is the greatest gift you have ever given? This brief passage is full of energy and surprise. There is fulfilment but also promise. We might wonder whether John’s words about Jesus are true to the Jesus reveled as Luke’s gospel unfolds. In these brief verses the fire seems to be all with John. Jesus accepts his baptism, prays and is deeply affirmed. The noun ‘baptism’ and the verb ‘to baptize’ occur a lot here. What does the word mean? Why might people think John the Messiah? What sort of Messiah would he have been? Why have the lectionary editors removed verses 18-20? Notice that expectant people ask big questions. Does this ring true to you? 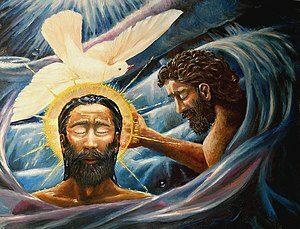 What emotions do you connect with John the Baptist? How does the word ‘beloved’ touch you? Are there questions floating around which only you can stand up and answer? Are you perhaps called to be a bit more Baptist-like in your life and ministry? When did you last use your winnowing-fork? The only thing Jesus does here is pray. Does that affirm or challenge your own priorities and to-do lists?